A versatile linking element in its own right as well as providing a rigidly held link between equipment. It may also be reversed to reveal a simple 4.. This versatile addition to the Gym Time system provides further exciting challenges to compliment this trendsetting range. Any of the four sides of th.. 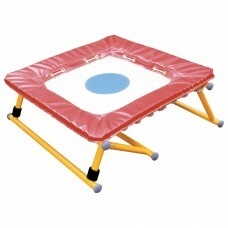 This versatile lightweight bouncer has been designed to compliment the other products in the Gym Time range as well as being suitable for use as a sta..
Use horizontally between Gym Time trestles, traditional movement tables, climbing frames etc. or at an incline in stepping/climbing activities. Can a.. Adds another dimension to the Gym Time system. They can be fixed quickly and easily along the length and width of both the bench and plain trestle to.. Using the Gym Time hook and loop fixing system gives a rigid climbing ladder up to or across a trestle or wall bar. 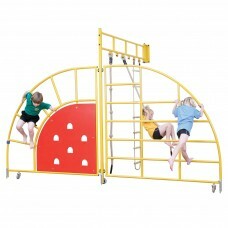 It can also be used as..
An exciting addition to the Gym Time range, the scramble Net offers children the challenging experience of working with a flexible climbing medium. Us.. This linking element can be used suspended between equipment for traversing, or used as a support for other linking apparatus. Used as a pair they pr.. 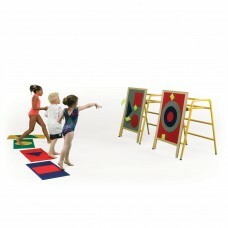 The market survey carried out by KPMG indicated that in many junior and infant schools, the job of teaching movement and gymnastics was falling on non..
Everyone who has seen these hook and loop targets has commented on how innovative and challenging they are. Developed as an aid to throwing .. 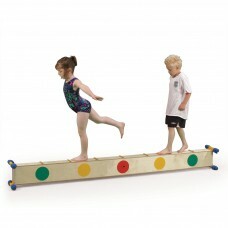 The Gym Time trestle system incorporates 450mm (18”), 760mm (30”) and 1070mm (42”) high trestles. The Plain Top (LGT040) can be fitted to any Gym Time.. The Gym Time Pack contains the following items:..